What do you want out of business? Governance and strategy are what this blog is all about, but governance and strategy themselves are actually all about making sure that business delivers its intended objectives. Objectives, in their turn, derive or ought to derive, from the mission statement of the organisation. The mission statement is supposed to say what the stakeholders want out of the business. Therefore even though this may seem to be a post on a lighter note than some of the posts in this blog, nevertheless I believe that this question really gets into the heart of what strategy and governance are actually all about. Strategy and governance are all about making sure that we want out of the business, we get. Therefore the starting point needs to be to ask ourselves the question, what is it that we actually want from business? This is a question which I’d like to ask today to anybody who is a stakeholder, please note I didn’t say “shareholder” but “stakeholder” in any business. Please consider the businesses in which you are a stakeholder, please identify the one which has the greatest importance to you of those businesses, and with regard to that particular business, please put into the poll below all of the answers which you see as being things that you want out of that business. Things that you are looking for from your stake as a stakeholder in that business. 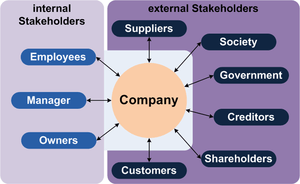 Hopefully this will show a nice cross-section of the different things which stakeholders are actually looking for from businesses, but if you can see in the list something which you are particularly looking for from your business please feel free to add it in the comments afterwards. Many thanks for taking part in the poll.